'We essentially tried to shorten the period of time that he is required to remain in the United States,' Shaked said. Justice Minister Ayelet Shaked (New Right) addressed the subject of Netanyahu's criminal cases and the suspicion that he received "sympathetic coverage" on the Walla news website in return for promoting favors for site owner Shaul Elovitch. Shaked, as part of a political panel of the Religious Kibbutz Movement in Rosh Tzurim, led by journalist Sara Beck on Sunday, said, "I came out against the leaks many times and said that it was wrong. However, there's always been leaks from interrogations so this isn't unusual." Shaked doesn't believe that Netanyahu is being singled out for selective enforcement of the law. "Selective enforcement is not the right word because [former PM Ehud] Olmert was also aggressively interrogated at the time he carried out negotiations with Abu Mazen to establish a Palestinian Arab state." 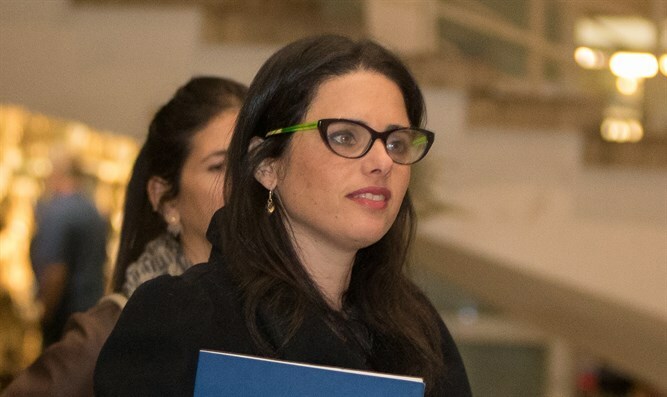 Shaked also referred to the Netanyahu-Noni Mozes talks, saying that the relationship between journalists and politicians should not be investigated. "I've said this countless times to the attorney general and the state prosecutor - don't criminalize the political process. The political process is a process of giving and taking and you have to be careful not to turn this process and relationship with journalists into a criminal one." "This is a problem of puritanism," Shaked emphasized, "I told them privately and I say it publicly - you must be wary of over-purifying and criminalizing the political process." "Ministers tell me that they don't want to be part of this system, that they're afraid of everything they do. They (the attorney general and the state attorney) need to know how to set boundaries. The relationship between journalists and politicians should not enter the criminal field." Shaked said that she is working behind the scenes to enable Jonathan Pollard to make aliyah from the United States to Israel. "I, as the justice minister, together with Netanyahu as prime minister, have been making great efforts in recent years to enable him to immigrate to Israel," Shaked told the panel. "We essentially tried to shorten the period of time that he is required to remain in the United States. If we're successful it will definitely be wonderful." Shaked refused to specify what specific actions she accomplished behind the scenes for Pollard. "I'm not elaborating at the moment but we've been working on this issue and I hope we'll succeed one day. We've been trying to make it happen for a few years." Shaked backs the prime minister regarding the purchase of submarines from Germany and his agreement to the sale of submarines from Germany to Egypt. "I'm sure that the considerations were relevant," Shaked said, noting that she was not a member of the cabinet during those years, but "Netanyahu will not sell state security for money."